If you've been near Brown Thomas lately, then you won't have avoided getting a whiff of this gorgeousness before you've even reached the Beauty Hall; Giorgio Armani Privé's latest EdT. 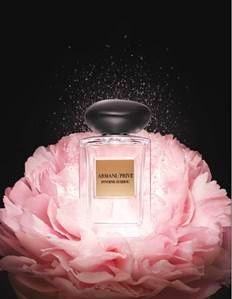 Called Pivoine Suzhou (yes, I haven't the faintest idea how to pronounce it either), this is the latest addition to “Les Eaux” collection and supposedly the first Armani Privé fragrance to be inspired by the gardens of Asia. The name comes from the UNESCO World Heritage site of Suzhou, a city of canals and bridges, fed by the Yangtze River, where pagodas can be glimpsed above the walls of ancient 6th-century gardens. Fun factoid: Marco Polo described Suzhou as the “Venice of the East”. This stuff (re-insert unpronouncable name here: Pivoine Suzhou) is also all about the peony. Flower-loving perfume people will adore this. Adore it. For those people who sit a bit more to the masculine type fragrances, or zestier zingier ones, this may not suit. Rose essence joins the peonies to make this an extremely floral, ultra-feminine scent. That said, there are also notes of tangerine, pink pepper and raspberry which break up what would otherwise be slightly too floral and sweet for my nose. The base base notes of musk and patchouli are also quite evident. It's definitely one of those perfumes where you can smell almost every single aspect of it - individually, and together; a very "together" blend in my opinion - am loving it. Although I've just been using up some samples, this stuff will be soon joining my other Les Eaux fragrance, a far more masculine but equally yummy Vétiver Babylone (bergamot, citrus, mandarin, cardamom, coriander and pink pepper, patchouli, vetiver). The Armani Privé fragrances don't come cheap - you'll usually find them exclusively at Brown Thomas Dublin & Cork for around €120, but it's for 100ml, and if the Vétiver Babylone or Pivoine Suzhou are anything to go by, should last you ages; the formula results in quite a lingering fragrance, so you won't need to be adding to this over the day - in fact, I love how these wear into your skin and really become something else as the day goes by. Yum, yum, yum.